Sweet potatoes blended with warm spices sandwiched between graham cracker crumbs combine for an easy, freezer dessert that’s budget friendly. Cook sweet potatoes until they’re easily mashed. Either bake them in the oven at 425°F for 1 hour until soft, or microwave them in 2 minute increments until soft. Once the potatoes are cooked thoroughly, remove the skins and place them in a mixing bowl. Mash them with a fork until they’re smooth but still have some texture. Measure out 2 cups of the mashed sweet potatoes to use for the recipe. Reserve the rest for a later time. In a separate mixing bowl, pour in pudding mix and pumpkin pie spice. Whisk in the milk until pudding mix is dissolved. Using a spatula, slowly fold in the pudding to the mashed sweet potatoes until everything is well combined. Crush the graham crackers in a food processor. You can also place them in a sealed zip lock bag and use a rolling pin to roll back and forth until crumbs form. This should yield about 2 cups of graham cracker crumbs. Cut a 1/4-inch slit into 12 paper cupcake liners horizontally. Spoon in 1 tablespoon of graham cracker crumbs into each liner. Spoon 2 tablespoons of the sweet potato pie filling on top of the graham cracker crumbs. Wet the back of a spoon with water and press down the sweet potato filling to evenly cover the graham cracker crumbs. Repeat to all 12 pops. Top the pops with a final 1 tablespoon of graham cracker crumbs. Using your fingers, press down firmly to make sure the graham cracker crumbs stick to the sweet potato pie filling. Repeat to all 12 pops. Gently stick the popsicle sticks in through the horizontal slit into the sweet potato pie pop. Place popsicles flat on a plate before freezing for at least 2 hours. 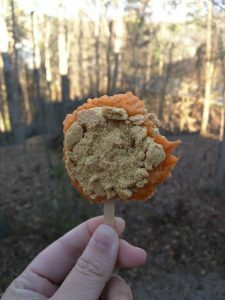 Remove paper liners before enjoying your sweet potato pie pops! You can prepare the pudding using any type of milk (skim, 1%, 2%, whole) or milk substitute (soy, coconut, almond, etc.) to suit your taste preferences and/or dietary restrictions. Just make sure it is cold before whisking it into the pudding mix.